Deanna and Nate getting the opportunity to interact with Tanya's palm cockatoo. What a fantastic meeting this was. It was nice to venture outside of our normal monthly meetings. 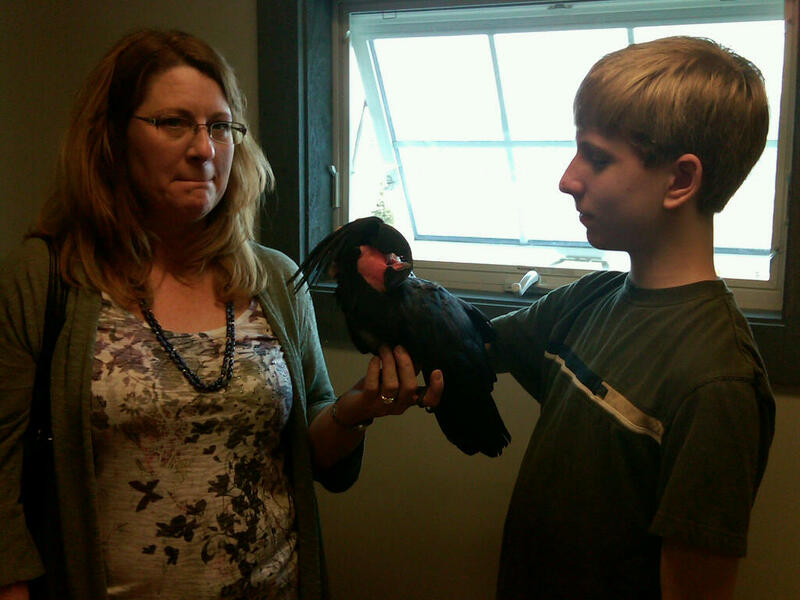 There was interest in visiting the Ann Arbor Companion Bird Club so we asked them. They discussed it and then invited us to come up and attend their April meeting. So on a warm 80 degree spring day we loaded a few cars full of members of the Parrot Society of NW Ohio and headed to Ann Arbor. It was neat to see how and where they have their monthly meetings. Their meetings are located on the property of Animal Kingdom Veterinary Hospital in Ann Arbor, MI. The facility houses many animals and is well worth the trip to visit. 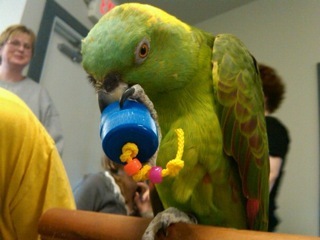 Melanie's amazon, Kuhara enjoying the new found foraging foot toy. great. You never know when you may need to contact someone. After the mingling, Lara Joseph was asked to give a presentation on foraging toys, their importance, and samples in making some. Easy “do-it-yourself” foraging toys were handed out among members of both groups and a great time was had not only making them, but having the birds there trying them. The proof is in the pudding. Just look at Kuhara eagerly tearing into her’s here. The importance of foraging, the effects on behavior in the wild and in captivity were discussed. Everyone seemed to really enjoy themselves. Thank you AACBC for giving us the opportunity to visit. Had a great time at the Ann Arbor meeting! Nice people, very welcoming & friendly. It was worth the trip just to see the fantastic facility they have there. Loved seeing the variety of the member’s birds too.